The top maintenance tip from HVAC professionals to help extend the life of your HVAC and furnace systems, aid in improved indoor air quality, and maintain overall efficiency is changing your filters regularly. For those individuals with a high environmental conscience, throwing used filters in the garbage can every few months probably seems extremely wasteful. If that sounds like you, then you’re in luck! There is another option: washable air filters. Washable air filters reduce waste that goes to the landfill plus they are easier on your wallet in the long-term. There are some great advantages to both types of filters and also some disadvantages. Let’s look at some of the differences between washable and disposable filters. Long-term cost reduction – The price tag of washable air filters is higher when compared to that of disposable filters, but when taken care of, washable filters will last you 5+ years. It’s recommended you change air filters at least every 3 months. If you do the math, washable filters pay for themselves quickly easily within the first year. 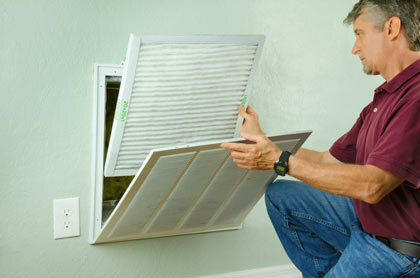 One washable air filter can usually replace about 50+ disposable air filters. If you normally spend around $10.00 for a disposable filter, the savings when using washable filters adds up quickly! Lessen your forgetfulness – Using washable air filters means the days of stocking up ahead of time on disposable filters are gone. If you’ve found yourself having to run to the hardware store just to buy a filter, you know what we’re talking about. Or maybe you buy them in bulk and then you have to store several at a time. This isn’t always convenient, especially for people who may have limited storage space. This is a huge advantage! Reduced waste – Disposable filters are normally comprised of cardboard, metal and fiberglass. Save all that waste from entering your landfill by using washable air filters. Fiberglass doesn’t naturally decompose, and the metal parts of the filter are time consuming to separate. Because of the various components in disposable filters and time restraints, usually all that material ends up getting buried in the garbage heap! Imagine the positive impact if every household used a washable filter. That would divert tons and tons of waste! With the advantages of washable air filters covered, it’s time to hit on the not-so-great aspects. There are several drawbacks that may keep homeowners buying disposable air filters. The Maintenance – With normal disposable filters, a change-out is usually rather simple. Remove the old filter, throw it away, replace it with the new filter. DONE! This is one of the biggest drawbacks to washable filters: they must be washed! You have to remove the washable filter from the intake, spray it down to remove dust and debris from the folds, then you have to let it sit to dry. While this cleaning and drying process is taking place, you must also make sure your HVAC unit or furnace is not running. If it’s left to run without a filter, your system can be damaged and the air you’re circulating is not trapping any of the particulates, contaminants and allergens. The cleaning process itself is not overly time consuming, but it can become a chore each time you have to clean your filter. It’s best to do this outdoors so any pollutants aren’t recirculated into your home or breathed in during the cleaning process. Once the washable filter is clean, you have to let it completely dry before reinstalling it. Some users of washable air filters will keep a spare filter to use in place of having to wait through the drying process. Less contaminant trapping power – Washable air filters are don’t come in a very high MERV rating, which rates the size of particulate that is removed from the recirculated air. Microscopic particles such as dust mites, mold, and smoke usually require a much higher MERV rating than washable filters allow. In some instances, you can find a washable filter that is above a level 6, but it is expensive and aren’t readily available. Disposable filters up to MERV 16 are easy to find at most hardware stores and home centers. Overall, this limits your indoor air quality goals. Attracts mold and mildew – If you don’t have the patience to let the washable filter thoroughly dry, they can become infested with mold spores and mildew. In essence, this totally ruins your indoor air quality. After all, that is the point of a filter! If you use a washable filter, be sure and let it dry completely before reinstalling. When the benefits are placed next to the drawbacks of washable air filters, you may find the savings and reduced waste a no-brainer. If you’re having a hard time making the decision, please contact the team here at M&A HVAC to discuss you options. It’s always recommended that you consult with a knowledgeable HVAC professional before you make any upgrades or changes to your filtration system as some switches in filter upgrades could negatively impact your system. Possible damage may occur. Reach out to our specialists here at M&A HVAC to learn more. You can reach us at 615-431-2500 or send us a message through the form on this page.